I say the same thing every year, “it’s too hot to cook” and it’s still true. Mainly because my kitchen faces the slowly setting sun that makes cooking about as comfortable as working in a roasting dish on Sunday. You’ll notice there’s been a lot of reviews lately because, like every summer, I have been avoiding the kitchen in the heat. But dinner still needs to get made and so I thought I’d inspire you all with some of my favourite salad recipes. Here’s one that got lost in a post about buffalo wings, because let’s all agree that when the conversation heads towards any kind of roasted or fried chicken pieces, salad does not get a look in. Last year I reviewed Katie Caldesi’s Around the World in Salads recipe book and I am still going back to it to find inspiration for meals and side-dishes to make in the warmer summer months. Here is a recipe that’s become a family favourite since. Not only is it colourful and crunchy and perfect for a BBQ, but it’s super tasty. That magical peanut-butter infused Asian dressing sends this salad to the front of the class. 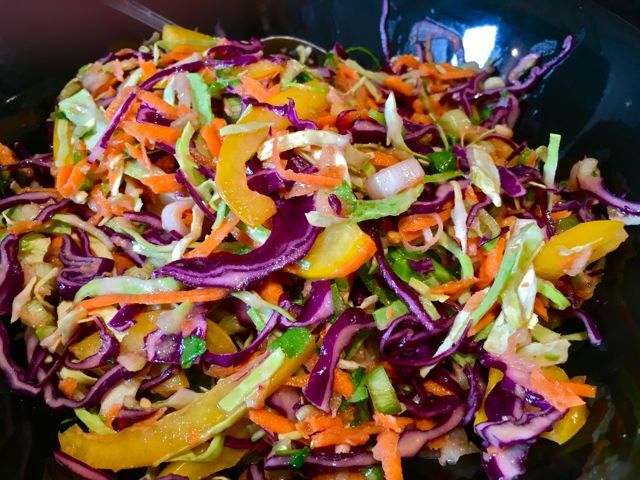 All those colours and textures and flavours make this a terrifically healthy salad, guaranteed to get even the most ardent vegetable hater excited about eating healthy. You can even, as Katie does, sprinkle over some roasted, salted peanuts to make this salad even more enticing. Place all the vegetables into a large bowl and mix. Place all the remaining ingredients into a jar and shake it around like crazy. Taste the dressing, and tweak to your liking before you pour it over the salad and mix together.